Egypt is well known for its incredibly warm weather that typically last all year. For visitors coming to Egypt, they may be looking for a way to relax, enjoy the scenery and stay out of the heat. Fortunately, Egypt offers a wide array of attractions that will help keep you cool in the day time. One of the best options for you would be to visit one of the great water parks spread all throughout Egypt. These water parks can offer your family a full day of fun and relaxation, all while staying cool. It is important to choose the best park for your trip, as many parks offer different specials and amenities. One of the premier parks for you to visit is the Aqua Park in Sharm el Sheikh. This water park provides you with a little of everything for everyone in your family. Your family can enjoy over thirty two different water slides. These slides range from simple slow paced water slides to fast corkscrew ones. Out of the thirty two water slides there are twelve intended for children. One feature of this water park that make it stand out from the rest is its heated pools. The pools here are heated year round so you can enjoy a dip even in the winter. Along with the pools and water slides there are a number of other water attractions here. Your family can enjoy splash pads, water playground(for children) and bigger pools(for adults and teens). The Aqua park provides you with plenty of options for food, snacks and beverages. You have your choice of restaurants, bazaars and cafes. Your ticket gives you all access to all of the rides, attractions and amenities of this park. Another great option for those looking for a awesome water park is the Aqua Blue Water park located in the heart of Sharm el Sheikh. The Aqua Blue Water Park offers you a number of different rides and attractions. Some of these rides include: Twister slides, Tube Free fall, Body slide and Rafting slide. These options are great for all members of your family. For the younger children there are awesome options including: Elephant slide, Mushroom and Aqua Tower(for the 4-6 year olds). These rides are safe and perfect for your younger children. The Aqua Blue Water Park is located on a 1500 square foot space that offers a number of amenities along with the rides. The water park is actually apart of the Aqua Park Complex. This complex offers you two unique hotels that are incredibly close to the water park. In fact you can easily walk from the hotel’s main office into the water park. Within the water park you will have your choice of different eateries. These eateries are all different themed(from Mexican to Italian). All of these restaurants are located near each other so it is easy for you to walk to and from the water park. 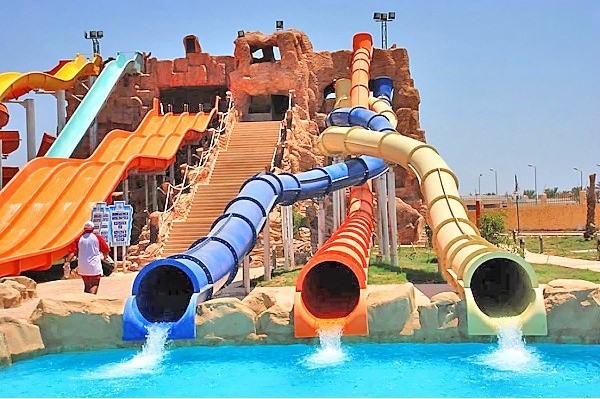 The water parks in Egypt, Sharm el Sheikh offer visitors a lot of options when it comes to water slides and rides. You can enjoy smooth, slow river rides or fast paced, twisting slides that will thrill you. Both of these options offer you plenty of choices on additional amenities that will help you enjoy the park. Both the Aqua Park as well as the Aqua Blue Water Park offer you your choice of different eateries to eat at. This means that you will not have to travel very far to enjoy good food.